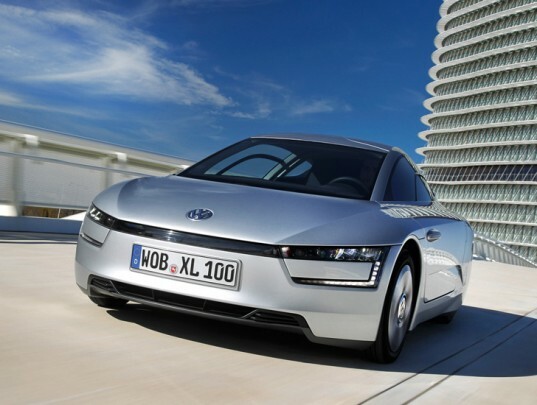 Renowned auto giant VW has revealed some details of its new eco-friendly hybrid dubbed the XL1, which promises a European Union-certified economy of 111.16kpl & carbon emissions of 21g per kilometer. The XL1 is a two-seat car, which has a 47bhp two-cylinder 800cc TDI engine accompanied by a 27bhp electric motor plus 5.5kWh battery pack. The XL1, which was first announced in the form of a running concept two years back, also boasts to have a CD rating of merely 0.189. Other striking features of the upcoming car include its carbon-fiber body, aluminum double wishbone front suspension, carbon-fiber reinforced plastic anti-roll bars, ceramic brake discs, and a semi-trailing link suspension at the back. The carbon-fiber body of the vehicle weighs merely 795 kilogram (kg) and measures some 3.8 m in length and 1.66 m in width. These dimensions make it slightly smaller than a Volkswagen Polo supermini. The company says that the XL1 can reach a top speed of 159.9kph, but can sprint from zero to 100kph in merely 12.7seconds. The Karmann, Osnabrück-based factory, is manufacturing the XL1, alongside the new Porsche Boxster and the Volkswagen Golf cabriolet. More details about the eco friendly XL1 will emerge at the Geneva motor show next month. The company said that the vehicle needs just 8.3bhp to be capable of maintaining a stable 100 kilometers per hour (kph). The hybrid structure’s electric motor and its devoted clutch are equipped between the 800 cubic centimeter double cylinder diesel engine and the XL1’s 7-speed DSG gear case. In addition, the great weight-saving steps comprise making use of carbon-fibre-built plastic for the body, the pelt of which is around 1.2 millimeter broad.